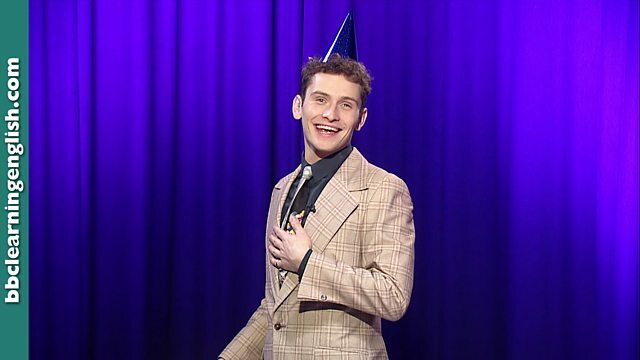 It’s birthday time for our host Will! This episode is all about the verb ‘will’. That little modal verb that does so much! There will be singing, games and jokes galore - whether the contestants want them or not! Will our contestants survive? Will Will have a good birthday? Did Leslie get him a birthday present? Find out in this episode of the Grammar Gameshow! Hello and welcome to today’s Grammar Gameshow! I’m your host, Will! Will Will be willing to let you win? All will be revealed. And of course let’s not forget Leslie, our all-knowing voice in the sky. Will! That little modal verb that does so much! It's my birthday and I’ll cry if I want to! Now, let’s meet our contestants! It’s nice to meet you. I’m Frank. James and Frank? Oh dear. It’s my birthday and what I say goes! Well… more than usual anyway! So now you’re William, and you can be Wilfred! Hey! You can’t do that! I love being called James! Quiet, William! You know, you remind me a lot of my uncle Wilbert. Why? Did he stand up for himself too? Oh no. He mysteriously disappeared! How about you Wilfred? Any problems? Good! Now that we're all ready, let’s have our first question. Like myself, the modal verb ‘will’ is a useful thing to have around. Have a look at these sentences and tell me what each use of ‘will’ is. Who wants to go first? Guys, guys, guys! You’ve got it all wrong! I Will. You William. You Wilfred! But if you can’t decide, we’ll use the buzzers. Here we go. It will rain tomorrow. That’s ‘will’ as a future auxiliary verb for a prediction. I’ll have orange juice please. That’s ‘will’ used for a decision made at the moment of speaking. Thanks for your help. I’ll pay you back on Friday. That’s ‘will’ used for a promise. Are you hungry? I’ll make you a sandwich. That’s ‘will’ used as an offer to do something. I’ll kill you for this! That’s ‘will’ used for a threat. Well done. ‘Will’ is a modal auxiliary verb, which means it’s always followed by a bare infinitive and doesn’t change to show person or time. It has many uses including future predictions, future intentions, instant decisions, promises, threats, and offers to help, among others. Good job both of you. Have forty-seven-ty-six points. On to round two. True or false: In the same way as the present simple, ‘will’ can be used to describe present habits and routines. It is true! Can you give me an example? I’ve heard that people will often not come home from this show. And if anyone’s going to disappear, I would much rather it be James. William! William! Of course! Of course! Well done, Wilfred! ‘Will’ can be used to describe present habits and typical behaviour, just like the present simple. I’ll kill you for that! Excellent use of ‘will’ for a threat, but minus ten points for going to the dark side on my birthday… just like Uncle Wilber! He was a bit of a wet blanket too... at first. Wilfred, twelve points for you. Our final question, then. In some ways ‘shall’ can be used as a substitute for ‘will’, but there are a few rules about its use. Give me three of them. We only really use ‘shall’ with ‘I’ and ‘we’. You can use ‘shall’ to ask someone’s opinion when making an offer. For example: Shall I open the window? The response to a question with ‘shall we’ is ‘let’s’ or ‘let’s not’. Good stuff. ‘Shall’ can be used to ask for advice and make suggestions and offers. However, ‘shall’ is usually only used with the pronouns ‘I’ or ‘we’. A common response to a suggestion with ‘shall we’ is ‘let’s’. ‘Shall’ is a little bit formal and a bit old-fashioned, but it has its place! Just like you, Leslie! Trapped for all eternity wherever you are! Excellent. Three points to William. And that brings us to the end of today’s Grammar Gameshow. But before we go… let’s play a party game! It’s my birthday after all. How about musical podiums? I’ll play some music and you two switch places. When the music stops, we’ll know who the winner is! Are you ready? Go! Oh, I neglected to nominate which podium would lose. Oh, well! Release the seagulls. And the winner is… me! Oh, Leslie, what do I win? Oh, Leslie! I thought you’d forgotten. You really are a true friend. Does that mean you’ll invite me to your party? But, that means I’d have to let you out of your box in the sky. I’ve invited your family though! Say goodbye, Leslie. An nyeong hee ge se yo, Leslie. 'Will' is a modal verb. This means that it is always followed by a bare infinitive verb and does not change for a pronoun. Its negative form is 'won't'. • Future predictions: Tomorrow, we will win the football cup final. • Future intentions: After I finish my degree, I'll do an MA. • Instant decisions: I think I'll order Italian food tonight. • Promises: He will take you to the cinema as soon as he's finished work. Trust me. • Threats: I'll ruin your career for doing this to me. • Offers: If your bag is heavy, I will carry it for you. Will can be used to describe present habits and typical behaviour too, just like the present simple. Its form is exactly the same, so pay attention to clues in context such as the time words in the sentence. On a typical day, I wake up at six a.m.
On a typical day, I will wake up at six a.m.
Shall is a a bit formal and more old-fashioned form of 'will'. In modern English, it is mainly used to ask for advice, make suggestions and make offers. When doing so, we tend to only use the pronouns 'I' and 'we'. A common response to a suggestion with 'shall we' is 'let's'. Both of these verbs are followed by a bare infinitive. A: I'm in serious trouble. What shall I do? B: I think you should tell the police. A: Shall we go to the cinema tonight? Are you too warm? Shall I open the window for you? 'Will' is a modal verb. This meas that it is always followed by a bare infinitive verb and does not change for a pronoun. Its negative form is 'won't'. Which of these sentences is an example of 'will' as a present habit? Shall is a a bit formal and more old-fashioned form of 'will'. In modern English, it is mainly used to ask for advice, make suggestions and make offers. It has a few important rules concerning its use. Can you remember them ? If not, remind yourself above! Which of these rules about using 'shall' is untrue?